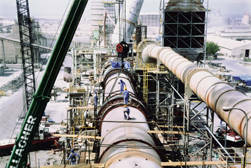 On a clinker rotary kiln ø 4,4 m x 74 m at a cement works in the United Arab Emirates, the capacity was increased from 3200 to 4000 tons/day. We have tailored the spectrum of our capability specifically to the cement, building materials, stone and ore industries. Our technical know-how and comprehensive experiences are specifically set up for an advantageous realisation of your project. Based on the mechanical characteristics of raw meal analysed in our technical centre and the burnability values established in our test rotary kiln, we determine the geometric dimensions of a kiln. The mechanical parameters of the kiln are then accordingly calculated with a finite element programme developed by our engineers. 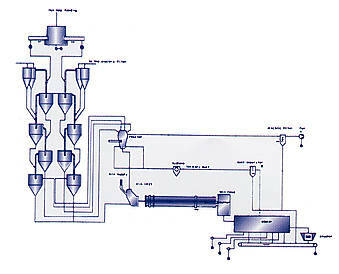 Using a computer simulation programme, the complete installation is reproduced and tested on the VDU. After repeated cross sectional testings, the design of the kiln and its main parameters are released for its detailed construction.